Serving professional and volume photographers across the U.S. and Canada, Richmond will expand their customers' ability to profit and grow with digital fulfillment and mobile commerce. Richmond Professional Lab is an industry leader serving professional photographers across the United States and Canada. With a specialization in volume school and youth sports photography, Richmond Pro Lab has built an enviable reputation in the market by delivering consistently high quality, the right mix of product, favorable pricing, and reliably fast turn-around. "First and foremost, we're excited about leveraging CaptureLife with our professional photographers to deliver digital images directly to a consumer's smartphone," said Blake Bullard, VP of Richmond Professional Lab. "It's going to be much more convenient, save everyone time, and help both photographer, lab and consumer address the decline of CDs as a viable long-term media." "Beyond that," Blake continued, "we certainly see CaptureLife as a remarkable and ongoing opportunity for mobile commerce and reorders. Photographers are excited about having our branded print store available through the app. It broadens the opportunity for increased revenue, and will make the unique workflow of order processing, fulfillment and reordering much simpler and more efficient for our valued photographers and their customers." Key to this new partnership was the integration of the CaptureLife fulfillment and mobile commerce platform with industry standard software programs in use by volume photographers and their labs. "It was critical to us that the CaptureLife solution nest seamlessly within the workflow that we and our volume photographers rely on and use," Blake explained. "PhotoLynx Flow and ROES integration is important to us and our photographers, and we were happy to see that the work has been done to address the unique needs of the volume photography industry." 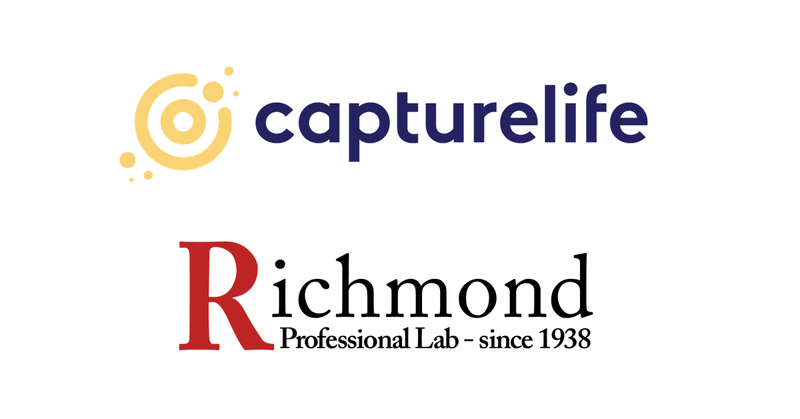 "We continued to hear from numerous youth sports and school photographers that they wanted CaptureLife to be integrated as a digital fulfillment and commerce solution with their trusted partner, Richmond Professional Labs," Scott DeFusco, CEO of CaptureLife explained. "It was clear to us that Richmond has a remarkable brand reputation, and an extremely loyal and vocal customer base of volume photographers that care about quality, speed and reliability." "We simply couldn't ignore those market requests, and we're honored that both Richmond Pro Lab and their photographers saw CaptureLife as the right solution." Scott said. "We're incredibly proud to be working with Richmond Professional Lab and their photographers, to be associated with such a quality brand, and to have them join our rapidly growing CaptureLife community as a key account."